The Tampa Bay Buccaneers started their rebuilding process last year and it showed with a 3-13 record. But the scary part is that the Bucs will be even younger in 2010 so even a .500 record, much less a playoff spot, is a pipe dream. This is now second-year QB Josh Freeman’s team, and he’s practically a veteran. For example, in this year’s NFL Draft the Bucs chose defensive tackles Gerald McCoy and Brian Price as well as receivers Mike Williams and Arrelious Benn – all four guys are expected to start from Day 1. McCoy and Price are being counted on to fix the team’s biggest hole last year: the NFL’s worst rush defense. The defense got much better last year when head coach Raheem Morris took it over and returned it to the one-gap, cover two scheme. The Bucs allowed just 17 points a game over the final six games. The offense should be better since Freeman has some experience now. He definitely needs to cut down on the turnovers after throwing 18 picks in 10 starts last year and fumbling nine times. But Freeman also led the Bucs to wins at Seattle and New Orleans at the tail end of last year. He will still hand it off plenty to Cadillac Williams, Derrick Ward and Earnest Graham, and all five starters return on a solid offensive line. Look for tight end Kellen Winslow Jr. to have a monster season as Freeman’s safety valve if Winslow can stay healthy. This ranks as the eighth-easiest schedule in the NFL, with an opponents’ 2009 winning percentage of .480 (123-133). There are five games against teams that made the playoffs last year. The Week 4 bye comes at a terrible time because any possible momentum the Bucs would have early will be stopped. The Bucs could very easily win two of their first three games – they are 2.5-point favorites over the Browns in Week 1 and, of course, get a Pittsburgh team that won’t have Ben Roethlisberger and will be playing in the unfamiliar Florida humidity that early. The Steelers likely will be starting Byron Leftwich, who was traded by Tampa Bay during the offseason. It’s hard to see the Bucs winning at Carolina, which has owned this series in recent years (11 of past 14). 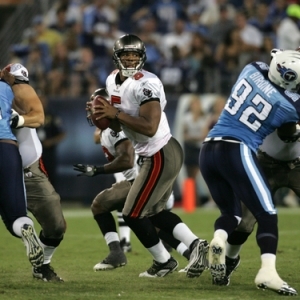 But the Bucs have won in Charlotte three times since the NFC South was formed – lastly in 2007. Tampa Bay has won eight of the last 13 meetings against New Orleans and five of the last seven against St. Louis. The Bucs should be 3-3 entering their toughest stretch of the schedule starting on Halloween as it has four of five games on the road and both two-game trips start with a visit to the West Coast (or thereabouts in Arizona’s case). That looks like a 1-4 stretch at best. December sets up nicely as a very winnable month. The Lions haven’t won a road game since October 2007. It’s oddly the fifth year in a row that the Bucs have faced Seattle and Tampa Bay has won the past two – including a blowout last year. And in the finale at New Orleans, maybe the Saints will have little motivation to play for anything at that point with a possible playoff seed locked up. That happened last year and the Bucs stunned the Saints in the Superdome. I definitely think this team can and will reach six wins, so I’d take the ‘over’.